Now if i were to have more than one gasifier would it bring my fuel consumption down more? Irishman wrote: Hi Tristan, you can put as many cells in series, as you can find space for. One guy has six cells on his Toyota Corolla and is getting 61.13 MPG, and uses 6 amps. I am going to stick with two for the time being, and play around with the amount of baking soda in the electrolyte. The more baking soda the more gas up to the point where it just makes heat, which you don't want. I have only 1/4 teaspoon at the moment. So far my gasifiers are running cold. The people that supply the s/s elements for the chlorofiers didn't bother to reply. Out in the sticks here we don't have anyone supplying swimming pools. Ron... were you able to post that PDF yet? long. The site will only be open for a few days, so if you want it, go for it now. No luck with the download. Hahaha :! : :! : haven't been through the whole thing yet but its real cheesy how they have super imposed graphics onto the vehicle on the cover page. I changed my design so that it is the same as Ron's. I installed it in the Tazz. I guess I must give the Tazz a good service before I test it again. On the tank before the unit was installed I go 11.8km/l and after I installed the unit got 12.9km/l. This is such a small difference. I think even speed or wind can cause the variation. I will service little Tazz this evening and we are going to Cape Town on Friday. So then I can do a test again. I think what I will do is to fill it up, drive to CPT and fill up there again. 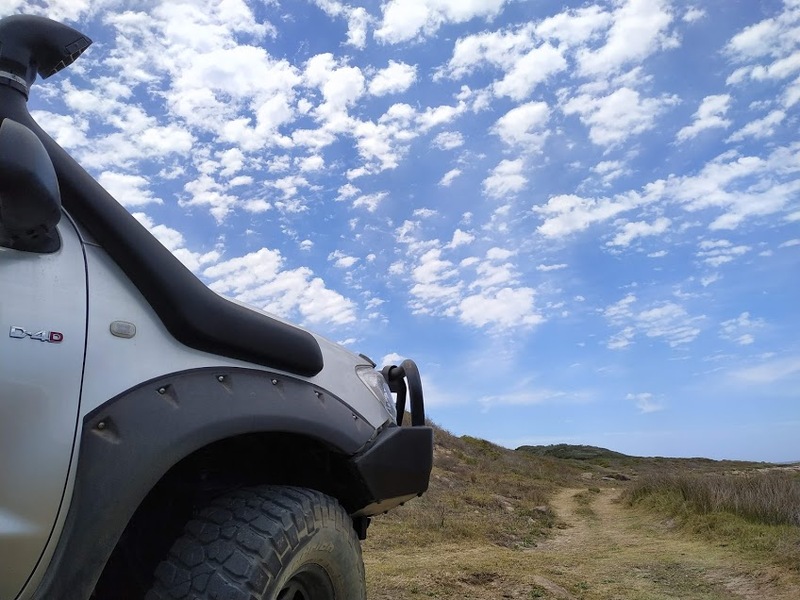 Then disconnect the Hydrogen thingy, drive back to Langebaan and fill up again, then compare the two. I can feel a increase in performance, the engine runs smoother and starts easier. So I can feel the improvement, I just expected more of a fuel consumption improvement. Hi Ron, No I only fitted one. Will pay around with it more. What milage do you get with your Hilux now? Pieter, I haven't had a chance to do a further test yet. What I did do, was increase the amount of baking soda to a level teaspoon, and I am making much more gas, and using more amps. The 5amp fuse holder melted!! The way I read it the more baking soda you use, the more gas you produce up to the point where your jar starts getting hot. Mine is making a lot of gas and I used a 15 Amp fuse from the beginning. I reckoned that it only have to melt the fuse if there is a short. I measured mine and it uses about 3.5 amps. I will replace the electrolyte before I go to CPT and then sommer make it stronger. After about 600Km it used about half the water. On the first picture below it shows that the water is brown. Ron is yours the same? I think the brown might be from the bakalite lid since it has a strong bakalite smell. 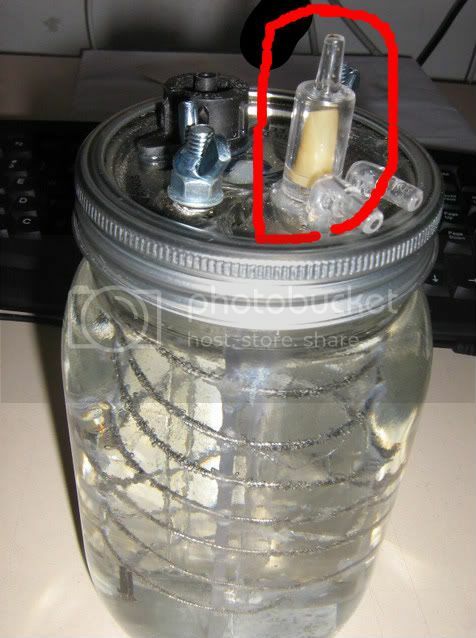 The second picture shows how much gas comes from the system, with fresh electrolite. Is there anybody who can perhaps organize us a gas analysis? Where are the scientists among us? The proffies or doctors? The only way we will know for sure what gas is coming off is if we do a proper gas analysis. Pieter, my electrolyte is a little discolored, but not brown like yours. I think the gas dosen't like that bakelite cover.I made the cover for the second gasifier from perspex. I did a trip the other day, and I thought my engine wasn't pulling as well as normal. When I stopped and looked under the bonnet one of my gas pipes had come adrift. So I am definitely getting more power with the gas system. I will make up my own as you chaps have done as I believe Bazz & Spinks charge around R1200.00 for a unit. They claim they have different size units. R 1200.00 !!! Well I will rather do it muself. **** And one more question**** Are ther any members of this Forum that live in Richards Bay or close. Would be great to meet up . I dont want to drift off topic here but you will have better luck finding members in Richards Bay If you start a new topic under General Discussions. That way more people will get to see it. Rich, what does that calculate to when are using a 4mm stainless rod, each electrode 1 meter long coiled to a diameter of around 5 cm. I have been playing with my concentration and at around 4 amps my electrode points that come out the container get nice and hot, but the water stays fairly cool for a while, but seem to run into thermal runaway after about 10 minutes and the amperage just does not seem to want to stay down. As the temp increases, the amps increase, the production goes up and the temp increases and there we have our circle. This however is on the bench and is on a constant power supply. My feeling however was to supply my generators from a variable circuit that derives it's pickup off the accelerator as I did not want the diesel to be fed HHO while idling. Comments please, I want to finalize my unit before I take on the road to the West Coast end of September for my holiday. Bfreesani wrote: Rich, what does that calculate to when are using a 4mm stainless rod, each electrode 1 meter long coiled to a diameter of around 5 cm. I'll post a photo of the s/s wire suitable for Electrode, incl. Price, Manufacturer, Retail Suppliers. I agree with Rich. 4 mm wire is way to thick. It should be 1.2m, and you start with a piece of wire 1.6 meters long before braiding. The guys in the states have experimented, and this size gives the best results. I ended up with snicking off about 15 mm after winding it round the tower. 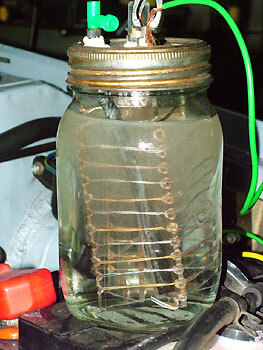 The voltage is 12 to 13.4 from the alternator, and the amps pulled depends on the strength of your electrolyte, which is controlled by the amount of baking soda you have added. If you overdo the baking soda the electrolyte gets hot, and you are just waisting energy. I am up to 3/4 of a teaspoon with no overheating, and it must be distilled water. One of my collogues was at a manne kerk kamp about a month ago. One of his friends also at the camp showed him the contraption he build and installed in his Opel Astra 1.6. It is a hydrogen from water system and the gas is fed into the engine with the air/petrol mixture. He claims to get 40 km/l on petrol consumtion with this setup. He uses about a litre of water on 200 kms I think. 2001 2.7i DC 4x4 Raider. REAL MEN FOLLOW JESUS AND STILL HAVE FUN! Very interesting topic this. That is incredible milage! Does that mean that if you take the open road, you have to fill up your water container frequently after every +- 200km if the container only takes 1 litre? As far as toping up goes I would guess the guy is using more than one bottle so it is probably a litre among the lot so the bottles wont run dry after 200km. Hi Tristan, I started with the electrolyte 25 mm below the top of the bottles (to allow for sloshing) and after 600k's haven't put in any water. That guy must have a very strong mixture of baking soda/water and is boiling off his electrolyte. His jars must be getting pretty hot. I reckon you shouldn't let the electrolyte get more than three quarters down the bottle. I am waiting to get my electronic dizzy fitted ( I waited at Motolek for three hours the other day in vain) before more tests, meanwhile my 4Y is running like a dream. Thanks for the warnings guys. I ended up with this "rod" as I could not source the wire I really needed. I saw this rod being used and copied a design of a German guy. I think the rod could work if a tone down amount of soda in my mix. I am using a small consol glass preserve bottle and not a large one. That halves my water and I was using a quarter tea spoon. I played again and got a fairly stable setup on half the soda. BUT, I think I need to have a look at the wire you guys are talking about here. I just need to relook the twisting to optimize the surface area of the stainless to the water. By the way, has anybody had a blow up in the garage yet??? I made a mistake a while ago and got flashback into my bubbler. My wife thought I had shot myself. Besides that, it just about cleared a half meter of tools and bits from the workbench. SO YES!!!!!! SAFETY is so important, this stuff is seriously potent. finally somebody "tested" the flashback. Sorry David, don't mean to be insensitive, but the safety issue was concerning me all along. I now fitted my hilux with LPG kit, and still have to sort out some backfires. THis is the reason why I have not yet added a booster to my lux. One of those backfires caused a tear in my air filter. I can just imagine what that, with hydrogen will do. I'm thinking of putting on my k&n cone filter I have lying around at home. Should be able to handle flashbacks better. If a bubbler was to go in the engine bay, how much damage could one expect??? David did you manage to take some pics of the hydrogen bomb?? LOL, no pictures.... Lucky thing is the consol fruit preserve bottles are designed to blow the lid off. So the glass did not shatter and cut anything (especially me) to pieces. I see the guys use a plastic bottle with fairly big plastic clip on lid for the bubbler and use it mostly as a anti flashback devise. It just pops off the lid and stops the whole feed to the engine. I am not sure how you rig a warning device for yourself that this has happened, or do you just find out that the car has very little power. Also not sure how much of the workbench clearing was caused by the explosion, or by me trying to pull the pipe out the bubbler before the flame got to it. Either way, it leaves a horrible smell in the air.. Oh no, wait, that was me . The HHO burns with no odor that I noticed. I imported a Canadian unit which draws 15 amps and produces a lot of gas. I have it fitted to a Mazda 2.5TD and see no change in my fuel consumption. It has no engine management system so there is nothing to negate fuel savings. The water4gas unit is a load of rubbish and also dangerous. Oh! no!!! and here I thought we had finally made some sort of record with keeping this thread on topic but its just a matter of time till we are all competing and comparing notes on who can make the biggest bomb!!! 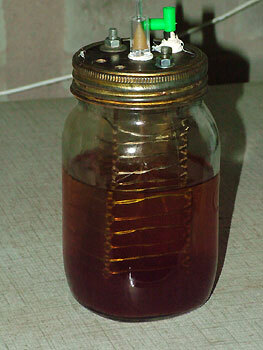 wigs wrote: I imported a Canadian unit which draws 15 amps and produces a lot of gas. I have it fitted to a Mazda 2.5TD and see no change in my fuel consumption. It has no engine management system so there is nothing to negate fuel savings. I wanted to check if the gas was hydrogen and lit a flame next to the pipe out the bubbler. Not a clever idea. After changing my pants, taking a tranquilizer and ordering a hearing aid I can confirm it does burn. No the revs do not increase and i dont understand it. After a couple of tests with only one cell in the Tazz I must say the improvement of consumption is not so big that I can say it is definitely better. Here with us and the wind it might as well be the wind. If it is better it is in the region of 8%. I can say for sure that the car are running better with the system switched on. It definitely has more torque. I am just wondering whether a standard 2.4 22R engine will be able to "absorb" this "new" type of combustion taking place without damaging valves etc ? My schooldays of running a fifty on racing fuel comes to mind.....and the engine did not like this. Hi Ian and Rich, I'm glad some one else is making progress. I am playing around with the amount of baking soda at the moment. According to the manual you can increase it until your gasifiers start getting warm. I am getting my electronic dizzy fitted to morrow, then I want to run another test. Unfortunately the only dyno outfit in Vredenburg closed down, so I can't get a decent tune up. I'm convinced I am running rich which of course wastes petrol. These crazy guys who are looking for gas with a match are asking for trouble. Thats the oldest joke in the world. Ian how many gasifiers are you using? TO all those who have tried the boosters in their vehicle, which type of flashback arrestor do you use. The guys seem to use the bubbler as the flashback device with a plastic cap that will blow off at fairly low pressure compared to a blow up. The amount of gas that is in the bubbler at any time is fairly small and burns off before the next bubble can be pushed up from the generator. Even when you use something like a fish tank bubbling stone that produces very small bubbles, the burn off is so fast that it does not continue burning on the water surface. (if that makes sense). This is part of the experiments that I did and why I can report on the "bomb" theory. I was also wanting to try a use the gas for heating and cooking, but it burns so fast that no device that LPG is used for will work. HHO unlike the other gases has Oxygen that it is carrying with it up the pipe. All the components for combustion are right there before it even hits the air at the end of the pipe. Irishman wrote: Hi Ian and Rich, I'm glad some one else is making progress. I am playing around with the amount of baking soda at the moment. According to the manual you can increase it until your gasifiers start getting warm. I am getting my electronic dizzy fitted to morrow, then I want to run another test. Unfortunately the only dyno outfit in Vredenburg closed down, so I can't get a decent tune up. I'm convinced I am running rich which of course wastes petrol. Hi Ian, it's nice to see someone else getting results. We will let our detractors pay for the a-rabs to fly their Lambos to Italy for an oil change. I can't understand why you are getting a voltage drop over the cells. They must be wired in parallel with a reasonably thick wire. I have a 10 amp in line fuse. The system melted the 5amp fuse holder! I reckon three cells are the best in our vehicles.